Staged at the home of the British Grand Prix, the annual Silverstone Classic is already established as one of the country’s premier automotive attractions. The event has wide family appeal and its central England location together with Silverstone’s long sporting pedigree and state-of-the-art facilities make it the ideal venue for show-goers of all generations. In 2011 more than 80,000 people attended the three-day summer festival savouring the very best of historic racing, huge displays of classic cars, a retail village, air displays, fun fair and live music from classic rock bands. Now the partnership with the AA will not only open up the event to a huge new audience but also add a new dimension to what’s already a spectacular and action-packed festival. The 2012 Silverstone Classic powered by the AA (20-22 July) will feature a significant AA attraction centred around Silverstone’s in-field Stowe Circuit based close to the venue’s impressive new Wing pits and paddock complex. The event will be promoted directly to the AA’s 15 million members and customers who will benefit from a10 percent discount on day and weekend entrance tickets. The event organisers have confirmed many of next year's major attractions. The on-track entertainment will showcase the full spectrum of historic motor sport with huge grids featuring an amazing array of Grand Prix, GT, Le Mans, single-seaters, sports and touring cars spanning more than seven decades of epic circuit racing history. Following the classic theme the 2012 live music bill will be topped by Adam Ant and Mike and the Mechanics with other high-profile acts to be confirmed. Tickets for the 2012 Silverstone Classic (20-22 July) are already on sale with discounted ‘Early Bird’ tickets available in good time for Christmas. Firmly established as the World’s biggest classic motor racing festival, next summer’s three-day Silverstone Classic will build further upon the huge success of this summer’s record-breaking event which attracted a massive crowd of more than 80,000. The on-track entertainment will showcase the full spectrum of historic motor sport with huge grids featuring an amazing array of Grand Prix, GT, Le Mans, single-seaters, sports and touring cars spanning more than seven decades of epic circuit racing history. The unrivalled race programme will be enhanced by an even greater variety of family entertainment than ever before. More than 120 car clubs will be displaying in excess of 7000 classic road cars many marking significant milestones in their marque’s respective ancestry. Adding to the high octane, three-day festival atmosphere, the very best of classic rock and pop bands will perform live on both Friday and Saturday evenings. A host of other live music attractions will appear over the weekend, too, as the ever-evolving event expands its ‘Rocking and Racing’ reputation. With more and more Silverstone Classic visitors staying on site at Silverstone to savour the massive on- and off-track entertainment package – and also take full advantage of discounted three-day and weekend tickets – an even more comprehensive choice of ‘glamping’ and camping options are now available for 2012. To cater for the Silverstone Classic’s spiralling appeal and popularity, a wide range of new and improved logistics and infrastructure have also been implemented in advance of next summer’s festival. These include better access to the venue as well as a significant increase in the number of buses transporting show-goers around the various attractions and between the two race paddocks. 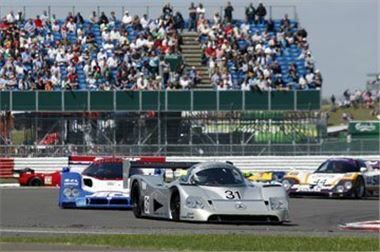 Boasting more than 1100 entries, the 2011 Silverstone Classic is believed to be the biggest race meeting ever staged in international motor sport history. To house such an unprecedented number of the world’s finest historic racing cars both Silverstone’s new Wing and National pit and paddock complexes were fully utilised. With perhaps an even greater number of entries predicted next summer, the full Silverstone facility again will be in operation come the 2012 Silverstone Classic. Although the full line-up of races is still to be announced, a number of grids have been confirmed. These include the full gamut of Grand Prix cars from the dawn of front-engined Formula One in the 1920s and 1930s right up to the DFV rear-engined generation of F1 cars from the 1980s. Evocative sportscars that have contested the legendary Le Mans 24 Hours will be out in force, too, with packed grids starring many of the Gallic endurance classic’s most prized racers ranging from the celebrated Ferraris, Aston Martins and Jaguars of the 1950s and 1960s up to the powerful turbocharged Group C prototypes of the 1980s and 1990s. Two of 2011’s highlights also return. Back in July, full 58-car grids of Historic Formula Junior and Under 2-Litre Touring Cars wowed the crowds with some spectacularly close racing and both are back by popular demand… as is a special star-studded celebrity challenge raising much-needed funds for selected charities. The full list of races will be confirmed shortly. The 2011 Silverstone Classic broke many records, but the biggest accolade for the event came after Guinness World Records confirmed that an official new record was set for the ‘largest parade of Jaguar cars’ when 767 E-type Jaguars took part in a special lap of the Silverstone Grand Prix circuit to mark the golden anniversary of Britain’s best-loved sportscar. In total, there were more than 1000 E-types on show at Silverstone celebrating the model’s 50th birthday in spectacular style and many similar milestones will be honoured in 2012. Notable landmarks include 50th birthday parties for the MGB, Triumph Spitfire, AC Cobra and Ford Cortina as well as for the TVR Car Club, plus the silver anniversary of the fearsome Ferrari F40. With more than 120 car clubs all planning dedicated displays, more than 7000 classic cars will be packed into Silverstone for another staggering power show. Full details of these and other special celebrations will be announced soon. Following in the wheel tracks of music legends such as Carlos Santana, The Yardbirds, Wishbone Ash, 10cc and Suzi Quatro, the 2012 live music line-up will feature the very best of classic rock and pop bands. Next year’s bill will be topped by Adam Ant and Mike and the Mechanics with other high-profile acts to be confirmed. Adam Ant and the Ants dominated the UK charts with a series of hit singles and subsequent albums in the early 1980s with the band’s second album ‘Kings of the Wild Frontier’ charting for 66 consecutive weeks including 12 weeks at number one. Adam Ant is now back with a new band and has recently completed a sell-out UK tour and supported Rod Stewart at the Hard Rock Calling Festival in London’s Hyde Park. Originally set up as a side project by Mike Rutherford, a founding member of Genesis one of the most successful groups of all time, Mike and the Mechanics also enjoyed Top Ten hit singles in the 1980s. The current band includes Andrew Roachford – a man who enjoyed his own major chart successes in the 1990s. With an increasing number of Silverstone Classic visitors taking advantage of special multi-day ticket offers and turning the three-day event into a pop-style festival, a more comprehensive choice of on-site camping and ‘glamping’ options is now available. These range from tent pitches on the fully serviced circuit-side Woodlands Campsite to unique Snoozebox accommodation set right in the heart of the action. The latter provides modern and stylish rooms complete with flat screen television, double bed, free WiFi and air conditioning. Full information on Snoozebox and all the other camping options is available on the event’s official www.silverstoneclassic.com website. For more information: Visit the official event website www.SilverstoneClassic.com or contact Jonathan Gill or Deborah Tee at the Silverstone Classic Media Office. Tel: 01372 414120 or 07860 563000.